Embraer announced today the acquisition of three Legacy 650 executive jets by Comlux. The business jets will be operated by the Fly Comlux Division, in Kazakhstan. The agreement includes options for another four aircraft. The first delivery is scheduled for the fourth quarter of 2011. The aircraft will be available for charter by Comlux customers. The Legacy 650 is a derivative of the Legacy 600. It will enable Comlux to fly up to 13 passengers in a comfortable, functional and elegant interior with three distinct cabin zones and a spacious galley, as well as the largest in-flight accessible baggage compartment of its category. 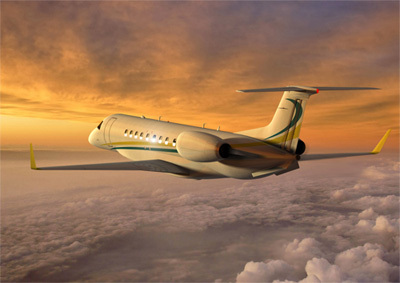 The two companies also agreed to cooperate in opening a service center for the Legacy 650 in Almaty, Kazakhstan, to support the Central Asia market. The Legacy 650 extended-range aircraft is one of the largest executive jets able to operate in restricted airports such as London City (U.K.) or Cannes-Mandelieu (France). The new Honeywell Primus Elite avionics suite provides enhanced functions to reduce crew workload and optimize the aircraft’s flight profile. The Legacy 650 flight deck is also equipped with FANS/CPDLC (Future Air Navigation System – Controller Pilot Datalink Communication) that improves situational awareness and flexibility in congested airspace, terrain-challenged airports and adverse weather conditions. Comlux The Aviation Group is one of the leaders in VIP charter services operating worldwide. Beyond charter operations, Comlux offers a comprehensive set of services to VIP customers who wish to have their own aircraft managed personally and professionally. This includes exclusive aircraft management, sales and acquisitions, cabin design and completion, as well as maintenance and engineering services. The group operates headquarters in Switzerland (Zurich), three operational centers with Air Operator Certificate (AOC) in Switzerland, Malta (EU-OPS) and Kazakhstan, four commercial offices in Zurich, Moscow, Almaty, and Bahrain, and a completion and maintenance center in Indianapolis, Indiana (U.S.).